STE 4.00 excels over STE 3.50 in some areas, and lacks in others. As this is a complete rewrite of the application, some of the previous features that you took for granted will be re-implemented in future updates. Whilst you can edit the page content in the editor, you cannot save your changes. Everything is read-only at the moment. Sometimes pages in the tree view incorrectly appear with a folder icon. I haven't determined the cause yet. I have recorded two new installation videos for the release. Windows users in particular should take note of the changes, which were made with the aim of making installation easier. Both videos can be found on the download page, under "How to install". STE 4 has been completely redesigned from the ground up to be extensible and more powerful than previous releases. The User Interface (UI) has evolved quite significantly. This is the STE launcher. You download this from the website, and it handles all future updates for you (except for when I update the launcher itself - that will require you to manually download the update). 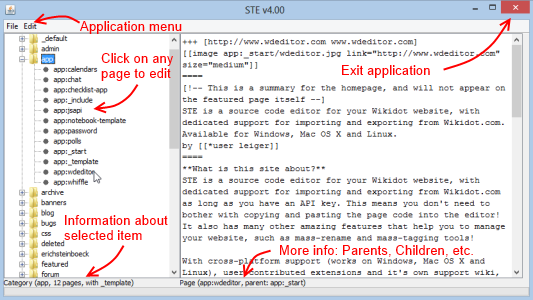 Once you have updated and launched STE, press F4 on your keyboard or select "Edit > Preferences…" from the menu. 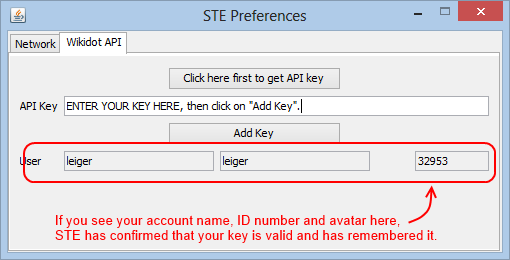 To use STE you will need to give it your Wikidot API key, which the application uses to interact with Wikidot's servers. All Pro account holders have an API key by default, which can be found here. Free users must request one first. Once you have entered your key, you will need to create a project. Each project represents a single wiki hosted at Wikidot. After creating a project, the pages for that site are automatically loaded into the editor. If you wish to reopen your project again later, you can do that from the "File > Open…" menu. You can download the latest launcher for STE from the download page. From the screenshots, it looks awesome! But I'm having trouble getting it to run. It could be an isolated incident (mine is a school laptop with Admin privileges but a rather odd UAC setting). I'm getting the same thing on my home PC. Hmm. Let me look into that. Same error on Windows Vista . Another download-"from" as before from dropbox for the launcher? Okay, I've pushed out an update to the launcher and it can be found on the downloads page. The issue affected initial installation only, so I didn't notice it with my own tests. It should be completely fixed now. The update-loader runs now.. but perhaps you should remark, that this will take some time. :)) . the site name contanis a hyphen - therefore i thougth it would be a good idea to have it the same name. 2. After the correct creation of the project - the next reminder(error message) - in the admin - panel the APOI Access was forbidden. So - after allowance - the opening of the existing project as incomplete ( properties incomplete) happens. Wow: but with the next creation of thesame project(1) ( the 2. time) the download of the 220 pages needed only 1,4 sec! 3. right mouse click on the page name does not open it in the IE browser..? But it is a wonderfull overbiew! Was NOT expecting this at all, best surprise ever! From what I understood, that allowed hyphens. But somehow they are still being disallowed (I was able to reproduce what you're reporting). I'll see if I can find a solution for it. Yes, sorry for not making that clear. Future releases may include a separate context menu for the page tree, so for page-specific functions you need to right click on the editor panel instead. James: Does STE 4 work with OS X Mountain Lion? I used a different method to create the OS X version this time, but as I do not have Mountain Lion I was unable to test if it fixed the issue you were having. The reason for this is because a hyphen acts as a range specifier when inside the square bracket character class. In you above example, you specified all characters between (and including) space and ampersand. @ Kenneth … Me too after my initial installation. Then I closed and reopened the app and it was fine. Ah, thanks. I forgot to mention that in the list of known issues. It's a side effect of how I am handling updates this time around. When you launch the main STE application, it updates the version number in a central place, which the launcher then detects next time it starts up. The main application is reading from this central location as well, for consistency. The problem is that it does this before it saves the version number, so the first time after an update it may display an incorrect version number. It should be easy for me to fix. I don't seem to have received it. This has now been fixed for you, thanks to James' help. Seeing as I'm having email difficulties, I attached the zip to this page: Click Here on your  Mac. Try using this (the Mountain Lion Jar Bundler) to bundle your .jar file. Hopefully it will work! The thing is - I'm no longer using Jar Bundler at all, even on my current OS! :) Found a more efficient solution. I'll give it a go though, if it means getting a ML version working. It installed and ran first time on my Windows7. It looks really good and the folder structure is just brilliant. A great piece of work, well done. I'm looking forward to being able to use it once saving and uploading is implemented. If I have any quibble - very minor and it's not really a quibble at all, just me being a wee bit grumpy as usual…well my car did brake down in the rain this morning - it is that project names have to be a minimum of 5 characters. All my work projects have 3 letter codes: in my pc folder structure, offline documentation, diary, accounting software, invoices, emails…. everywhere. For example an upcoming site I'm working on today at http://gtr.wikidot.com is GTR, strathpeffer village is SVL etc….you get the idea. Being old it's a struggle to remember more than 3 letters at a time. But in STE4 I couldn't create a project with just 3 letters. Is there any way of relaxing this 5 character restriction? Tell me about all of your quibbles… minor or not. Feedback is good, particularly if it's bad feedback, as it allows me to improve the application. The 5-character restriction will be removed in the next update. Minimum length for project names has been reduced from five (5) characters to three (3). Wow! I didn't think it would be possible at all, let alone achieved so fast. Thanks very much Shane. There were a couple of reasons for me originally deciding to set a minimum of 5 characters, but most of them are planning for the future and I'm sure I can find a workaround before then. I'd rather you be able to use your three-character acronyms. Soon I'll add a project properties dialog, which will allow you to rename your project, delete it, or change the site name. I just saw STE 4 today and I'm really impressed. One little thing: I hope you will add a font size slider in the preferences because the text is a little small and hard to read. 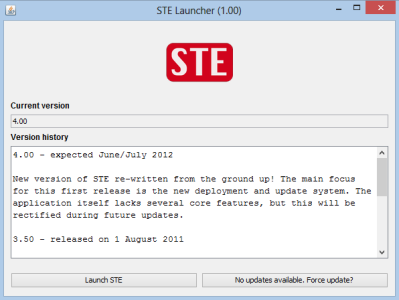 If the launcher is able to recognise an STE update, download the .jar file and in turn launch it . . .
Would this in turn mean the launched STE program would be able to recognise a launcher update and download the .jar file ready for next launch? Thanks Vlad :) Glad you like it. I'll look into adding the font slider again. James: Theoretically, yes. However I'd rather leave the launcher as a manual update. There are too many variables to consider in that case (e.g. where the launcher is actually located, and your operating system). And whilst STE is running, the launcher is technically still active so that could have unexpected side effects. Not worth my time to make a launcher update seamless, when the aim is to make launcher updates only happen on rare occasions anyway. Once the rush of last-minute fixes has settled down a bit, the launcher is likely to remain unchanged for months. I was going to make a wish that the Launcher would automatically launch into STE unless there was an update available (launcher or STE specific). And maybe holding down a certain button whilst launching the launcher could be an "override" to use the launcher without booting into STE. I noticed that yesterday, but haven't looked into why yet. Here is fine for now, anyway. You can click on "Launch STE" immediately - even if it's still checking for updates. No need to wait. I might be able to put the focus on that button automatically, so that pressing Enter as soon as you launch STE essentially 'skips' it and goes straight into the main application. Add reply on "STE 4.00 Release"